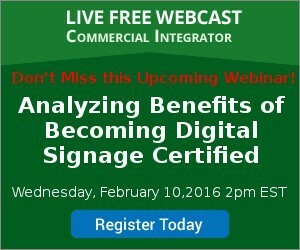 Join renowned digital signage expert Alan Brawn on February 10 as he anchors a discussion on why certification may be critical for those looking to capitalize on massive demand for digital signage. The growth of digital signage and demand for it is staggering. The digital signage market is predicted to grow at an 8 percent clip per year to reach $23.76 billion in 2020, according to MarketsandMarkets. It’s the kind of momentum that integration firms should be building capabilities around specifically to capitalize on it. There is a window of opportunity for integration firms to establish themselves as their customers go-to providers of digital signage solution—and that window will eventually close since plenty of other industries are vying for that business. Integration firms should consider getting key employees trained to become a Digital Signage Certified Expert. Digital Signage Federation (DSF), the Digital Signage Expo (DSE), and numerous manufacturers, distributors, resellers, and end users have partnered with the Digital Signage Experts Group (DSEG) to bring a comprehensive set of industry certification programs to the digital signage industry. Alan C. Brawn, principal of Brawn Consulting and member of the board of directors for DSEG wants to make a case to Commercial Integrator audience members on why being a Digital Signage Certified Expert is extremely beneficial as integration firms and consultants look to growth their digital signage businesses—and that should be a vital growth priority. Brawn and CI editor Tom LeBlanc will be joined by a Digital Signage Certified Expert integrator, who can offer first hand perspectives on the process and benefits. With Digital Signage Expo 2016 following the next month and offering Digital Signage Certified Expert training, the discussion couldn’t come at a better time.